The world’s top-ranked match racer, Harry Price (AUS), and his recent match racing nemesis, Leonard Takahashi (NZL), finished the first day of Balboa Yacht Club’s 52nd Annual Governor’s Cup Youth Match Racing Championship tied for the lead against the toughest competition in the event’s history, with records of 7-1. The prestigious “GovCup”, presented by Farmers and Merchants Bank, is the oldest youth match racing championship in the world. While Price went to the top of the world rankings last week, in last year’s Governor’s Cup and in more recent youth championships in Australia, Takahashi has come out on top in their matches. With eight flights completed out of eleven in the first of two “round robin” series, where each skipper sails each other once, their one loss records make them early favorites to qualify for the four boat semi-finals, which will commence Friday. However, their positions are by no means safe with defending champion Christophe Killian (USA) close behind at 5-3.
and is meant to keep it fully-hoisted all day. 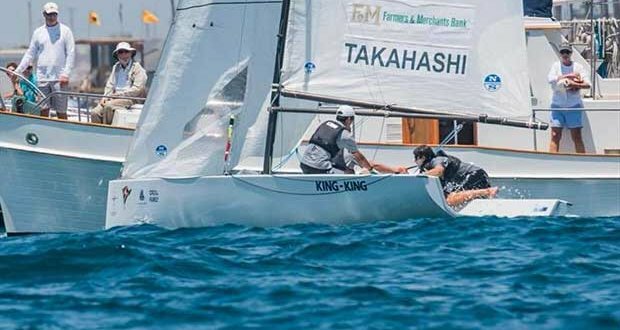 The extra loss caused by Killian’s halyard problem is not fatal to his chances, but his later loss to Takahashi put him a full two races behind. Killian is joined at 5-3 by Chris Weis (USA). Weis, Killian, Takahashi, and Price were the semi-finalists in the 2017 GovCup and were considered the early favorites this year. While the Governor’s Cup is limited to sailors under the age of 23, the world rankings led by Price are not. Almost all of the GovCup skippers are highly ranked and represent the most talented group ever assembled at the event which, given the careers of many Cup alumni, is impressive. That alumni includes America’s Cup winner, James Spithill, and many winners of the Congressional Cup and the World Match Racing Tour. Twelve skippers are competing in this year’s event, coming from five countries – Australia, Denmark, New Zealand, the United Kingdom, and the United States. 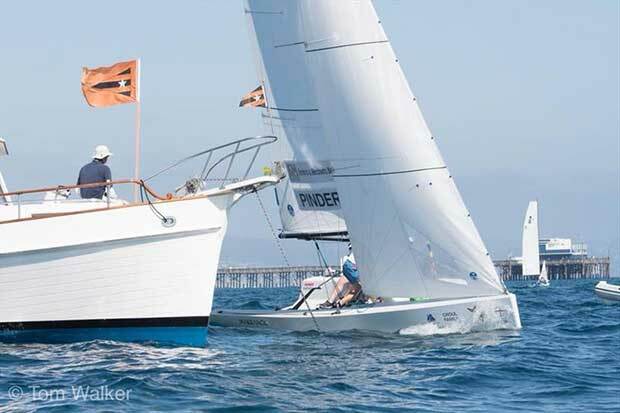 All the teams are provided with “Governor’s Cup 22” boats, which are high performance sloops designed by Balboa Yacht Club member, Alan Andrews, specifically for Newport Beach conditions. With “flat top”mainsails and masthead spinnakers, they performed well in the 5-9 knots of breeze throughout the day. The final four races of the first round robin will be completed tomorrow (Wednesday) with the first start planned for 11:30 AM. Spectators are looking forward to the last race of the first round robin, which will pit leaders, Takahashi and Price, in their first match of the Championship. It is early enough in the series that all of the competitors still have a chance to make the semi-finals, although given the experience of the four leaders, it will be a tough job. However, both the GBR and USA youth match racing champions, Matt Whitfield (GBR) and Jack Parkin (USA), are among dozen skippers still in the hunt.